Stay up to date with Atech news and announcements, as well as third-party logistics trends. 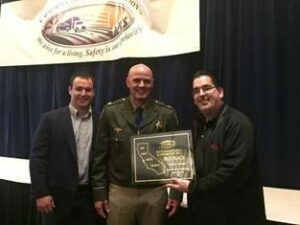 On April 5th, members of our team attended the California Trucking Association’s Fleet Safety Awards Banquet at the Sheraton Grand Hotel in Sacramento. This awards banquet honors trucking companies who exemplify and uphold the highest standards of fleet safety. The criteria for being selected as an awards finalist is rigorous; it is based on company safety programs, miles driven, accident ratios, FMCSA data and CHP information. Hundreds of carriers submit their applications but only 3 winners are selected per category. 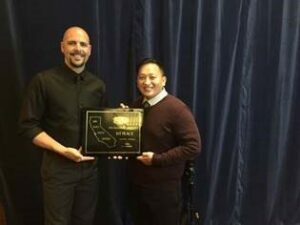 It is an honor to be selected as a finalist as it represents the highest recognition by the CHP and California Trucking Association to be judged against our peers. Atech is VERY PROUD of our drivers, teams, and staff to their commitment to safety each and every day. Your hard work, dedication and relentless focus to safety makes a difference! It was a special moment when Atech received the highest honor and awards for Safety! Congratulations to all Atech Teams!! There are many benefits companies gain by outsourcing their supply chain management and logistics to dedicated 3PL providers. Third Party Logistics offers an all in one solution for warehousing and distribution services. Utilizing a dedicated 3PL provides businesses with a reliable logistics advantage, and maximizes profitability through combined knowledge and resources. The following are 5 key advantages to partnering with a dedicated 3PL provider. Dedicated 3PL providers have a vast resource network available that provides advantages over in-house supply chains. Using a 3PL’s resource network, every step in the supply chain can be cost effective and extremely efficient. 3PL’s can leverage available capacity which drive down cost and result in lower overhead with the benefit of fast efficient service. Choosing a Dedicated 3PL provider allows your company to benefit from resources that are unavailable in-house. Outsourcing warehousing and logistics will create a savings of time, money and risk for your company. Utilizing a 3PL provider eliminates the need to invest in warehouse space, technology, transportation and personnel to run the logistics process. Partnering with a dedicated 3PL eliminates your risk and exposure and allows you to focus on your core business. The advantage of a 3PL is the dedicated platform and fixed cost which allows you to manage your logistics and reduce risk with full control over your savings. A dedicated 3PL provider is knowledgeable of industry best practices, and is current with the latest developments in technology, manufacturing and logistics. 3PL technology is capable of improving delivery processes, enhancing driver productivity and providing powerful analytics. Outsourcing warehousing and logistics allows your company to focus on your core competencies, and leaves the rest to the experts. 3PL dedicated services allows you to have peace of mind knowing your business is in the right hands. A benefit of using a dedicated 3PL provider is the ability to scale space, labor and transportation according to inventory and supply chain needs seamlessly. Businesses with seasonal fluctuations can enjoy stress free transitions between industry upturns and downturns, having the ability to utilize more space and resources when needed. Using a 3PL allows your business to grow into new markets transparently. Outsourcing your dedicated warehousing and logistics needs to a preferred partner is a definite competitive advantage. Dedicated 3PL providers have the resources at hand to make adjustments and improvements during each step of the supply chain process. 3PL professionals will ensure your needs are met by utilizing the fastest, most efficient and cost effective methods. A 3PL provider has the tools to restructure the supply chain and uses the latest technology to ensure the proper amount of goods arrive on time where you need them and in good condition. Dedicated 3PL’s can maximize profits, reduce inefficiencies and improve customer service.